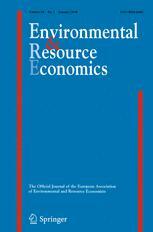 Article publication « Demand-Pull Instruments and the Development of Wind Power in Europe: A Counterfactual Analysis » by Marc Baudry and Clément Bonnet in the Environmental and Resource Economics review. Renewable energy technologies are called to play a crucial role in the reduction of greenhouse gas emissions. Since most of these technologies did not yet reach grid parity, public policies have been implemented in order to foster their deployment. The approach that has been privileged in Europe is the demand-pull approach that aims at creating a demand for these new technologies and at stimulating their diffusion. This paper examines the effect of demand-pull policies on the diffusion of onshore wind power technology in six European countries: Denmark, France, Germany, Italy, Portugal and Spain. In a first step, a micro-founded model of diffusion is calibrated in order to replicate the observed diffusion of wind power in these six countries.